last update, 5.17. I recently had the opportunity to eat at one of the more interesting pizza places in town. 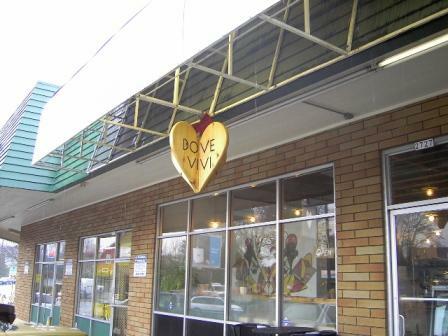 Dove Vivi opened last summer close to the corner of NE 28th and Glisan in that odd little mini-mall pocket opposite Plaid Pantry and kitty corner to Pambiche, the Cuban restaurant. It’s a nice addition to the tip of the NE 28th “restaurant row” scene. Eschewing tradition, Dove Vivi uses a cornmeal crust that is thicker, crunchier and somehow tastes more “buttery” than other pizza styles I’ve had. I’ve been told by friends that the pizza remains crispy for much longer than traditional pies, even if you take it home, throw it in the fridge and subject it to the microwave the next day. This might not be everyone’s ideal pizza selling point, but it speaks volumes about the nature of their crust, and how it differentiates them from other pizzas such Neapolitan or Chicago deep dish styles (even though Dove Vivi does use deep dish pans to bake theirs). 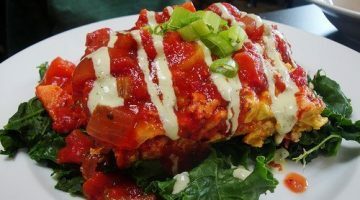 Pizza is the star of the show here, however, and the preparation is pure Portland style – top-notch ingredients and careful preparation. 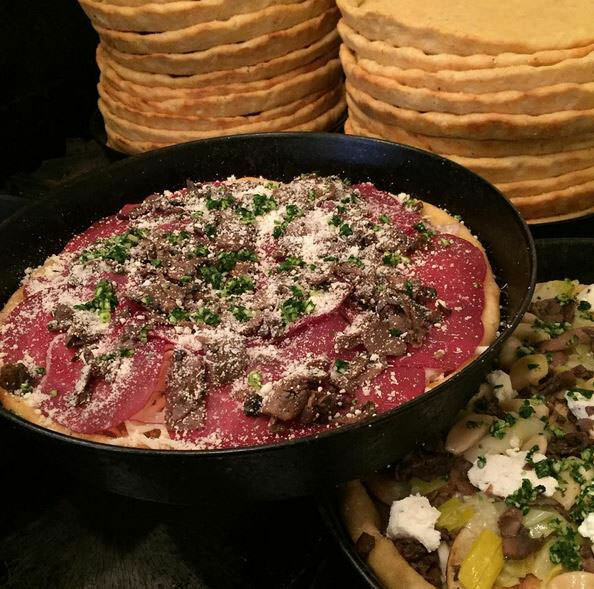 Although Dove Vivi’s style of pizza might not be what many people expect pizza to look or taste like, what sets them apart, in addition to the non-traditional crust, are the extremely well thought-out and sometimes surprising flavor combinations. 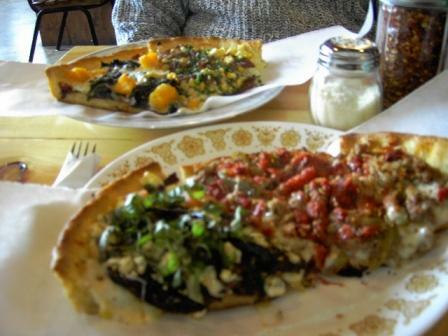 Many local pizzerias use artisan sausage, local produce, and quality cheeses. But who else would offer a pizza featuring corn, balsamic marinated roasted red onions and chives; a sautéed kale, butternut squash and roasted walnuts; or roasted red peppers and baked fennel with mozzarella and fontina? And while there is reason to worry that this one, as well as their menu of over 21 plus different pies is simply more California-style pizza carnage where anything left in the freezer gets thrown on top sooner or later, these flavor combos make for some tasty results that are well balanced and harmonious. They are also quite large and filling. All can be ordered by the slice for $4.50, half a pizza that equals 3 generous slices $12.50, or a whole 12″ pizza for $24.75 no matter the toppings. Pizzas are available in house or to-go, and if you want they will par-bake them and you can finish them off at home. In addition, since the pizza is made thick with a generous amount of toppings, the best way to eat them is with a knife and fork, Euro style. In addition, and thankfully, unlike some other “artisan” pizzerias in town Dove Vivi is open during the day as well as evenings. Of course not everything works perfectly. For one thing depending on how busy they are, it can take a while to get your slices, so keep that in mind if you’re in a hurry. Also, slices are sometimes made from pizzas that are already prepared so that the staff can quickly finish them off in the oven. The upside to this is that you can get almost ANY pizza Dove Vivi offers by the slice. The downside is that sometimes you have to wait longer for them to make a pizza that isn’t already pre-made, or alternately, the slices can sometimes taste like they have been sitting longer than they should. Of the five slices my table sampled, one was clearly too “tough.” Was it because of their slice system or was this just a bad batch of dough? I don’t know, but it just wasn’t as tender as the others and the crust was hard as a rock making it difficult to bite into and eat. This was the one exception though – all the others were terrific. The restaurant itself is basic, with simple wooden benches and chairs, open duct work in the ceiling, and water served in chilled mason jars. The service is quite friendly and attentive and the whole operation seems clean and well organized. In addition to the pies, Dove Vivi also offers a small selection of fresh and generously sized salads, such as your standard mixed greens $5, a beet with walnuts and blue cheese $5.75 – $8.50 and daily specials like a roasted carrot or other seasonal ingredients. Overall, first impressions are very good here. At first flush Dove Vivi, which roughly translates from Italian to mean “where you live,” is a welcome addition to the artisan food and pizza scene in Portland. I’ll be back. I’m a big fan of Dove Vivi. Nice review, but you left out the sweet graciousness of the proprieters. They always make me feel welcome and at home. This was more of a “first impression” review – not really a full review. That may come later. But I agree. Every time I have been there they are always friendly and helpful. Very nice people. Another big fan here too. I guess have had a slice that didn’t taste super-fresh but it still wasn’t too bad. Do do wish their salad dressing on the basic greens had a little more zing to it but it’s nothing a little salt, pepper and Parmesan can’t fix. Absolutely LOVE the pesto pizza. As a pizza purist I pretty much expected to hate Dove Vivi. Well, I liked it a lot. I think the big thing is to go there with an open mind. I had a simple red pepper and sausage and I liked how it was hearty but not at all greasy. Here you about the “buyttery crust”. How do they do that? Is it butter or olive oil? I don’t think it is butter that makes the crust buttery, unless they use a different recipe for their vegan pizza. By the way – even if you eat dairy you should try the tofu ricotta. It is wonderful! Also, one thing you didnt mention is that the service is outstanding. I have been there twice and both times with a complicated situation (large group, picky mother) that they managed flawlessly! I went here today. Though I’m not a huge fan of deep dish type pizzas, I thought the toppings were pretty good – nice and fresh. might i add, as much as i don’t want to let the secret out since it means less cookies for me, that they have the most delicious buttery yummy three-chocolate chip cookies EVER? just don’t expect them all the time–they sell out fast, from my experience. For someone who detests deep-dish pizza… I have to admit I was pleased with my pie. Thanks for the well-thought-out beer selection, folks (I’m a whore for Belgian Blonde Ales.) One word of warning – if you are in a hurry, and think it will take the usual 2 minutes to heat up a slice, you are in for a world of wait. For obvious (deep dish) reasons, it took about 20 minutes to heat up our slices. I’m a little sad about the cookies, as our kitchen is right around the corner. Competition so close to home? Damn! My friend and I ate there last night and it was really good. We started with the roasted beet salad which was delicious and a good size for the price, and then we had half of a vegan pizza. It had cashew cheese, roasted onions, and corn, and the crust was awesome. If you are one of those people that think pizza can only be one way, and has to taste exactly like the one at Luigi’s in Brooklyn (a made up place), then this place is probably not for you. We had the dessert (I think they only offer one – other than the cookies), and it was good, but needed a little something else (some kind of sauce drizzled over it or something as it was a little on the dry side). And I know someone will write and say that it is a traditional Italian dessert and that if you put anything else on it that it is blasphemy and that I’m an idiot for even suggesting that one desecrate this noble dessert, but . . . . And a bonus is that beers are inexpensive, and the staff is really friendly and helpful. My family and I ate here last night. My husband has heard great things about Dove Vivi for months, and has persistently been trying to get me to go there with him. I’m a traditionalist when it comes to pizza, and the idea of a cornmeal crust scared me off. I was pleasantly surprised. Somehow the crispy, buttery crust really works with their deep dish style pizzas. We got to try 5 different meatless pies, and my favorite was the fresh corn with carmelized onions and smoked mozzarella, followed by the pesto pie. The garlic pie was also very good, with lots of large cloves of carmelized roasted garlic. The salads were more than large enough to share and delicious. The staff at Dove Vivi was incredibly friendly and helpful, and the service was great. The leftover slices that we brought home were almost as good the second day, and the crust was nice and crusty. My only complaint is that their homemade chairs are a bit uncomfortable. (next time I’m bringing a cushion). Other than that, everything was wonderful and I’ll definitely be returning. I was disappointed recently to hear that they have closed for lunch. I sure hope they’re doing OK. If you haven’t tried it, please support this fantastic place. One thing I’m surprised they haven’t done is fix their signage problems. Their big wooden sign is unreadable from the street. They recently added the little wooden hanging heart sign that is also hard to see from the street, and is often blocked by umbrellas. They have a giant metal awning over the store that could easily be painted with their name. I have fantasized about sneaking up there in the middle of the night and stenciling their name up there for them, just because I want them to be visible and stay in business! I’m another picky pizza convert, skeptical about the crust until I tasted it. Their ingredients are fabulous, the folks are nice, and the crust is yummy. I’ve been a big fan of Dove Vive. Yesterday I had a bad experience at the very end of my visit though. About 5-10 minutes after my three friends and I had finished eating, while we were finishing our conversation and our drinks, a man in a striped colorful shirt approached us and asked us if we wanted anything else. When we said no, he said there’s a wait for tables and that we need to leave. We looked around and there were two open and clean tables inside and at least one outside. We didn’t say anything and just quickly left. I’ve never experienced that kind of treatment at any other restaurant. Our entire time at Dove Vivi was about an hour and 15 minutes total. I definitely won’t go back to socialize with friends since they seem to want you out as soon as possible.